This Graying Gear Gal does not make decisions quickly. I shop carefully and choose wisely. Safety and practicality are of prime importance! I purchase boots for warmth, traction, and longevity. The latter asset saves me from shopping a lot. I confess to being a long time Sorel customer. I still have every pair of Sorels that I have ever purchased as well as the extra, unused felt liners that I added to my original purchase in case I ever needed to replace the original liners (which I didn’t). I have the Glacier model and the Manitou; these are my work horse boots. I was shocked to discover stylish Sorels appearing out of the back country and into our daily lives. 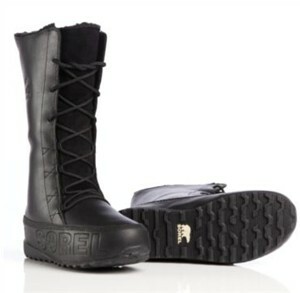 I received a pair of Sorel Shila boots. They are incredibly fashionable: water proof leather boots that rise to one’s high calf. They have a full front lace closure that allows the wearer to pull on the boots easily and to adjust the snugness to the calf perfectly. They come in black, tobacco, and British tan and are available in half sizes. Shila boots have fleece lining for comfort and for wicking moisture away from your feet; this lining is removable for drying just like my die-hard, traditional Sorels. The tread is solid! I am able to pull on my ice grippers, an act that was never possible on my older, bulky Sorels. Let us not remove safety on snow and ice for fashion; fashionistas do not have to be dare devils. One can be prudent and chic! Now I have to learn to say thank you in response to compliments about my attire. I admit to being someone who NEVER allows a car dealership to affix their decal on my new cars so it is astonishing how much I love the Sorel logo emblazoned across the side of each boot! The maple leaf in the “o” advertises Sorel’s Canadian roots as well as my own family connection to Canada. It also advertises that I am wearing well-made, warm boots even though I am stylish. WARNING: Do not go to the Sorel website unless you are ready to buy new boots. I was amazed to see the styles available.